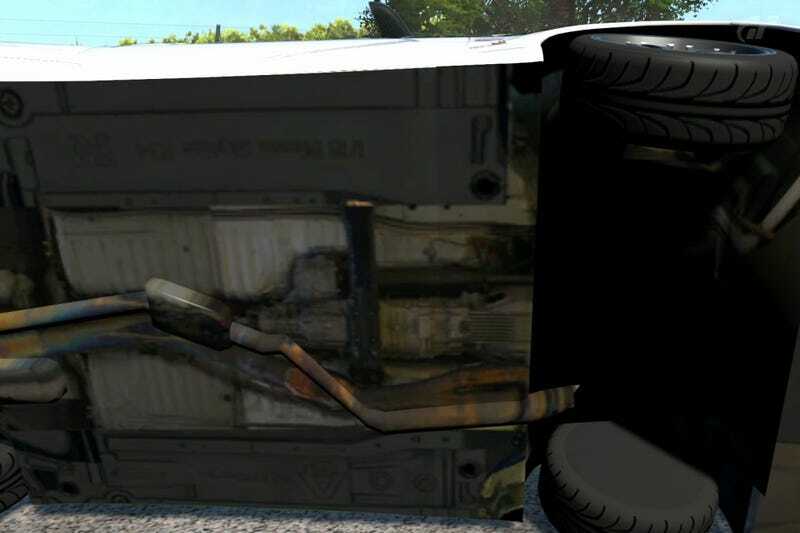 Real driving simulator Gran Turismo 5 features an Easter Egg for lovers of model cars. The undercarriage of a GT5 auto sports the logo of die-cast collectible maker AUTOArt. Enjoy it while you can, because that logo will soon be erased. According to Gran Turismo 5 designer Kazunori Yamauchi, the developers collaborated with AUTOArt, receiving "materials" of older models' undersides. "That's a vestige," Yamauchi adds via Twitter. AUTOArt make extremely detailed model cars that fetch over $100 for one car. As previously mentioned, AutoArt models were spotted throughout the offices of Polyphony, the game's studio. Kotaku Japan wonders if Polyphony Digital forgot to erase the AUTOArt logo? "It (the logo) is way too interesting," Yamauchi tweets. "It will be erased in the next update." The reason for this? "Because it's embarrassing." Embarrassing? This Easter Egg is hardly that. Fitting is a better word to describe the logo's appearance as it not only suits the game's ad campaign, but connects with one of the psychological reasons why people play GT5: namely the car collecting. Do You Love Cars As Much As Gran Turismo 5 Loves Cars?